You'll be £10.00 closer to your next £10.00 credit when you purchase Steam in Scotland. What's this? Kevin McCormack has written a large number of transport books mainly using previously unpublished material, much of it sourced from the Online Transport Archive. This, his latest colour album, covers the railways of Scotland in steam days and concentrates as much as possible on depicting older types of locomotives. 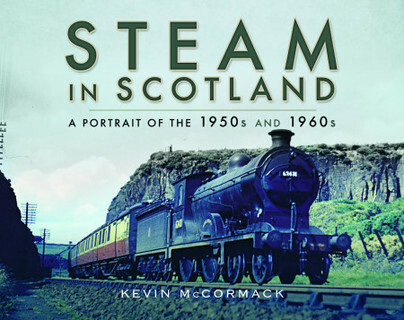 Consequently, this volume contains a large amount of rare 1950s colour images, often depicting areas of the Scottish railway system that were later closed or cut back during the Beeching era. The pictures in this book, were taken by enthusiasts who had the good fortune to be able to afford colour film, at a time when such luxuries, were very expensive, to the average enthusiast. All the photographers concerned, travelled far and wide in Scotland with their cameras, at a time, just before most of the lines closed, between 1953-1967. The result of all this effort, is a fine collection of very rare images, depicting a lost period of railway operation, in a beautiful and picturesque part of Britain. This high quality publication is a photographic portrait of the 1950s and 1960s featuring superb all-colour images of locomotives in various locations all over the country. For steam lovers this book is an essential addition to your collection featuring most of the well known classes throughout those years. Entertaining captions, and a useful index of locations at the back, make this book stand out a little from the many previous works on the subject. The author details his personal railway-related story, introduces the reader to Scottish railways (the subject of this volume), and provides details about the origins of the photographs that have been used within it ... For readers seeking ‘Pictures of British steam trains in a Scottish setting’ this volume will be a delight, as they are there in quantity.